Thrombospondin type 1 domain–containing 7A (THSD7A) is a target antigen identified in adult membranous nephropathy (MN) along with the major antigen phospholipase A2 receptor 1 (PLA2R1). 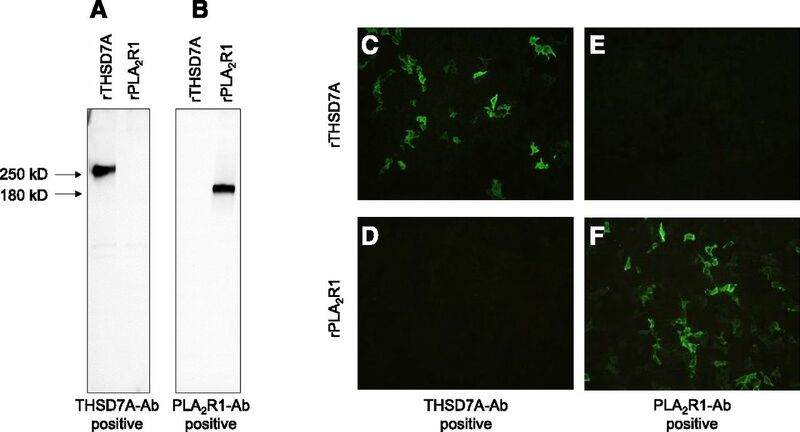 The prevalence of THSD7A-Ab–positive patients is unknown, and it is unclear whether the clinical presentation differs between patients positive for PLA2R1-Ab or THSD7A-Ab. We screened serum samples of 1276 patients with MN from three different cohorts for the presence of THSD7A-Ab by Western blot analysis and a newly developed indirect immunofluorescence test (IFT). Compared with Western blot analysis, the IFT had a 92% sensitivity and a 100% specificity. The prevalence of THSD7A-associated MN in a prospective cohort of 345 patients with MN was 2.6%, and most were women. In this cohort, the percentage of patients with THSD7A-associated MN and malignant disease significantly exceeded that of patients with PLA2R1-associated MN and malignant disease. In all cohorts, we identified 40 patients with THSD7A-associated MN, eight of whom developed a malignancy within a median time of 3 months from diagnosis of MN. In one patient with THSD7A-associated MN and metastases of an endometrial carcinoma, immunohistochemistry showed THSD7A expression on the metastatic cells and within follicular dendritic cells of the metastasis–infiltrated lymph node. We conclude that the IFT allows sensitive and specific measurement of circulating THSD7A-Ab in patients with MN. Patients with THSD7A-associated MN differ in their clinical characteristics from patients with PLA2R1-associated MN, and more intensive screening for the presence of malignancies may be warranted in those with THSD7A-associated MN. The initial clinical descriptions did not reveal any evidence that there might be differences in the clinical presentations of patients with PLA2R1-associated MN and patients with THSD7A-Ab–positive MN. This assumption, however, based on a relatively small cohort of THSD7A-Ab–positive patients.2 We also lack detailed information on the prevalence of THSD7A-Ab–positive MN compared with the PLA2R1-Ab–positive form of the disease. To answer these questions, it was necessary to assemble a larger cohort of patients and focus on the clinical aspects of those patients who are THSD7A-Ab positive. To pursue these tasks, reliable and high-throughput assays for detection of THSD7A-Ab are needed. It was, therefore, the purpose of this study to identify and analyze THSD7A-Ab–positive patients in three cohorts with a total of 1276 patients with MN. For THSD7A-Ab measurement, we applied Western blotting and a newly developed indirect immunofluorescence test (IFT). Our results should help to better characterize possible differences between PLA2R1-Ab– and THSD7A-Ab–positive patients. In total, 1276 patients with MN from three different cohorts (one prospective [Table 1] and two retrospective [Supplemental Tables 1 and 2]) were screened for circulating THSD7A-Ab by IFT. In the prospective Hamburg cohort, 259 of 345 patients were PLA2R1-Ab positive but negative for THSD7A-Ab by IFT. The remaining 86 patients were negative for PLA2R1-Ab in both IFT and Western blot analyses. THSD7A-Ab could be detected in eight of these patients by both IFT and Western blot (Figures 1 and 2, Tables 1 and 2). 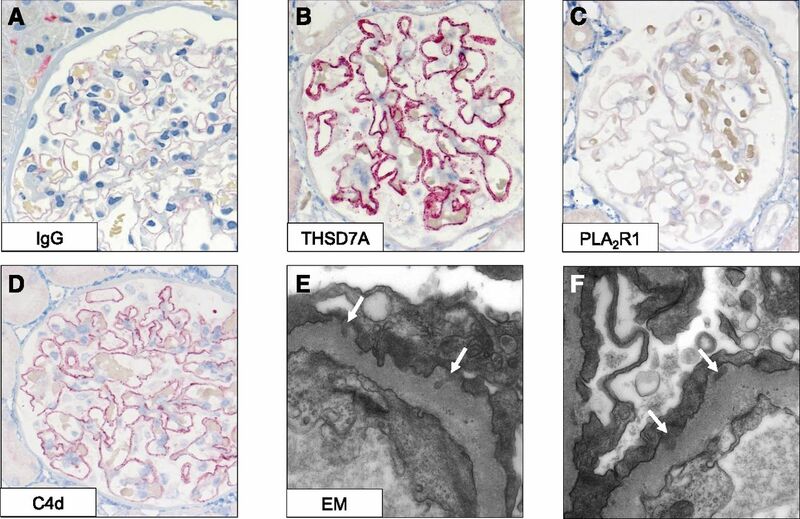 In 65 patients, THSD7A immunohistochemical analyses of the renal biopsies could be performed, including in six of eight THSD7A-Ab–positive patients. In these six patients, an enhanced glomerular THSD7A staining was detected. In one additional patient (patient 7 in Table 3), enhanced glomerular THSD7A staining was detectable, although the patient was negative for THSD7A-Ab by IFT and Western blot, bringing the number of patients with THSD7A-associated MN in the prospective Hamburg cohort to nine. All remaining 58 patients showed a normal THSD7A staining of the renal biopsy and were negative for THSD7A-Ab in the serum. The detailed results of the immunohistochemical, IFT, and Western blot analyses for PLA2R1-Ab and THSD7A-Ab in this cohort are presented in Supplemental Material (Supplemental Figure 1). The retrospective Hamburg cohort included 119 PLA2R1-Ab–positive patients who were THSD7A-Ab negative in the IFT analyzes. The 570 PLA2R1-Ab–negative sera were analyzed for the presence of THSD7A-Ab by Western blot and IFT. In 18 patients, THSD7A-Ab could be detected by both IFT and Western blot. In two patients, THSD7A-Ab was detectable by Western blot but not detectable by IFT. In the Boston cohort, 11 patients were found to be positive for THSD7A-Ab by Western blot; 10 of these also tested positive for THSD7A-Ab by IFT (Figure 2). All remaining 231 patients were negative for THSD7A-Ab by IFT and Western blot, and 153 of these patients were PLA2R1-Ab positive. All 112 patients of the control group were negative for THSD7A-Ab and PLA2R1-Ab (Supplemental Table 3). All 40 patients with THSD7A-associated MN were negative for PLA2R1-Ab in the IFT and Western blot analyses. Taken together, the IFT had a 100% specificity and a 92% sensitivity for the detection of THSD7A-Ab compared with Western blot. At the start of the study, no significant correlation between proteinuria and THSD7A-Ab levels was detected (Figure 3), with a Pearson correlation coefficient of r=0.27 (P=0.11). For 11 THSD7A-Ab–positive patients in the Hamburg cohorts, follow-up data over at least 12 months (median follow-up time =36.0 months) were available. One patient progressed to ESRD after 9 months. Four patients had a complete remission of proteinuria, and THSD7A-Ab became negative in all of them. Five patients had a partial remission of proteinuria; THSD7A-Ab became negative in one of these patients, and it remained positive in the other four patients. One patient had no remission of proteinuria, and the THSD7A-Ab persisted. Detailed information of these patients is included in Supplemental Material. The clinical baseline characteristics of the 40 identified patients with THSD7A-associated MN are presented in Table 2. Because of our finding that THSD7A-associated MN might be associated with malignancies,6 clinical data from these patients were thoroughly searched for history of malignancies. Eight (20%) patients with THSD7A-associated MN had a malignancy, which was diagnosed at a median of 3.0 months (interquartile range, 0.5–11.5 months) after diagnosis of MN (Table 3). In the prospective Hamburg cohort, 25 (7.2%) of 345 patients had a malignancy diagnosed within 2 years of the diagnosis of MN (Table 1). A malignancy was diagnosed more often in patients with a THSD7A-associated MN (three of nine; 33.3%) than in PLA2R1-Ab–positive patients (14 of 259; 5.4%) or patients who were negative for both PLA2R1-Ab and THSD7A-Ab (eight of 77; 10.4%; P<0.001 and P=0.05, respectively). In the Boston cohort, 18 of 242 patients had a malignant disease: one (9.1%) of 11 patients with THSD7A-associated MN, eight (5.2%) of 153 PLA2R1-Ab–positive patients, and nine (11.5%) of 78 patients who were negative for both PLA2R1-Ab and THSD7A-Ab had a malignancy. In the retrospective Hamburg cohort, data on the screening for secondary causes of MN were not consistently collected; however, 13 (1.9%) of these patients had a malignant disease. Four of these 13 patients had a THSD7A-associated MN (Supplemental Table 1). In both the prospective Hamburg cohort and the Boston cohort, patients with THSD7A-associated MN more often had a malignant disease compared with patients with a PLA2R1-associated MN (33.3% versus 5.4% and 9.1% versus 5.2%, respectively). In the prospective Hamburg cohort, this difference was statistically significant (P<0.001) after Bonferroni adjustment for multiple testing. For 18 THSD7A-Ab–positive patients in the Hamburg cohorts, renal tissue was available for THSD7A staining. All renal biopsies showed an enhanced THSD7A staining, and four of these patients had malignant disease (patients 1, 2, 4 and 7 in Table 3). A comprehensive analysis of these biopsies showed no significant differences in IgG4 positivity or other histomorphologic characteristics compared with in patients without malignancy, except for in the number of inflammatory cells per glomerulus (Table 4). In patients with malignancy, more inflammatory cells per glomerulus were found. The follow-up of patient 1 (Table 3) has already been described.6 Two patients (patients 2 and 6) were treated with immunosuppression in addition to the removal of the tumor. They had remission of proteinuria. Patient 7 had a partial remission 8 months after removal of the tumor without immunosuppression. The two patients with metastasized prostate carcinoma (patients 4 and 8) had no stable remission of proteinuria and died 20 and 38 months after diagnosis of MN, respectively. We have no follow-up data on proteinuria for patients 3 and 5. We recently described the case of a patient with THSD7A-associated MN and a gallbladder carcinoma.6 Since then, we screen patients presenting with THSD7A-associated MN thoroughly for malignancies. Patient 7 (Table 3) presented at our institution with nephrotic syndrome. A renal biopsy revealed THSD7A-associated MN (Figure 4). The patient had a history of endometrial carcinoma, which was surgically removed 17 years ago with no signs of a relapse. No THSD7A-Abs were detectable in the serum by IFT or Western blot. Because of the diagnosis of a THSD7A-associated MN, we performed a search for malignancies. A computed tomography scan revealed a retroperitoneal tumor. The tumor was a lymph node infiltrated by metastases of an endometrial carcinoma (Figure 5A). 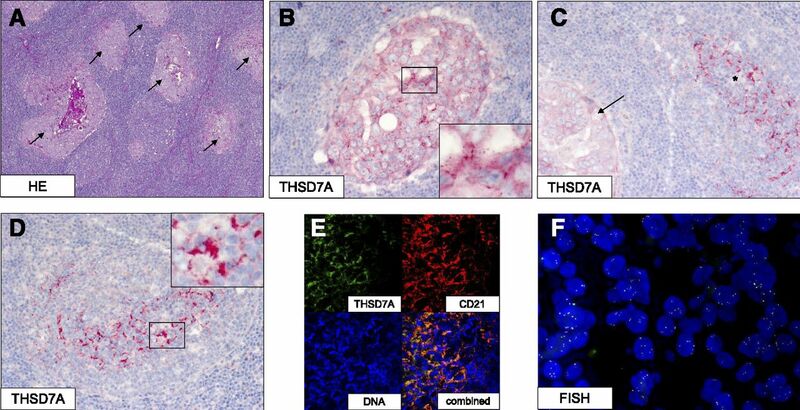 The metastases were positive for THSD7A by immunohistochemistry (Figure 5, B and C). Follicular dendritic cells (fDCs) of the tumor–infiltrated lymph node were positive for THSD7A (Figure 5, C–E). FISH analysis revealed a polysomy of chromosome 7 with up to four copies of the THSD7A gene and chromosome 7 centromere, respectively (Figure 5F). The lymph node infiltrated by the metastases showed a 12.3-fold increase of THSD7A mRNA levels compared with in healthy lymph nodes. With the recent identification of THSD7A as a target antigen in MN,2 differential diagnosis of patients with MN becomes more antigen specific. An important step that established the role of PLA2R1-Ab levels in the clinical management of MN was the availability of reliable and easy to perform tests for the detection of PLA2R1-Ab.7 An IFT was initially available8 followed by an ELISA,9,10 and both are now commercially available for clinical testing. In our prospective cohort of newly diagnosed MN, 2.6% of the patients (and 10.5% of PLA2R1-Ab–negative patients) had a THSD7A-associated disease. The Boston cohort shows similar results, because 12.4% of PLA2R1-Ab–negative patients were THSD7A-Ab positive. These findings probably represent the true prevalence of THSD7A-associated MN, whereas a number of reasons might be responsible for why the prevalence of THSD7A-associated MN is significantly lower in the retrospective Hamburg cohort. Diagnosis of most of these patients was not within 6 months of the first serum analysis; many of the patients were on immunosuppressive treatment. Although the prevalence of THSD7A-associated MN in this cohort probably might be lower than the true prevalence of this disease, these data offer insight on how often THSD7A-associated MN might be encountered in daily clinical practice. One central question is pertinent: is it important to differentiate THSD7A-associated MN from PLA2R1-associated MN? The finding that 20% of patients with THSD7A-associated MN had a malignant tumor diagnosed within a median time of 3 months from diagnosis of MN suggests that patients with THSD7A-associated MN may be more prone to additionally have a malignant disease. In the prospective Hamburg cohort, patients with THSD7A-associated MN significantly more often had a malignant disease than patients with a PLA2R1-associated MN. In the Boston cohort, this difference did not reach statistical significance, probably because of the smaller number of patients. There is a number of possible explanations for the differences in prevalence for malignancy between the prospective Hamburg cohort and the Boston cohort. The study protocols of the cohorts were different. In the prospective Hamburg cohort, consecutive patients diagnosed with MN were included; therefore, the study population was recruited independently of the antibody findings. In the Boston cohort, patients with malignancies were selectively recruited, especially those who were negative for both PLA2R1-Ab and THSD7A-Ab, leading perhaps to an increased prevalence of malignancies in patients negative for PLA2R1-Ab and THSD7A-Ab. Patients in the prospective Hamburg cohort were very closely and prospectively monitored for development of malignancies over a relatively long time (29±19 months, with follow-up visits every 3 months). The small number of patients with THSD7A-associated MN might also play a role in these findings. The potential clinical importance of these findings is highlighted by not only the number of patients who have malignancies in the THSD7A-Ab–positive cohort but also, the finding that the malignancy may have a causal relationship with the development of MN. We present here a patient with remarkable similarity to a patient recently reported by us.6 The patient in this study had THSD7A-associated MN in combination with metastases of an endometrial carcinoma. Even more importantly, at the time of diagnosis, this patient had no clinical signs of a malignant tumor. It was the diagnosis of THSD7A-associated MN, which led us to perform thorough examinations for malignancies, that ultimately led to the diagnosis of the metastases of the endometrial carcinoma. Similar to the first patient, assessment of the tumor showed polysomy on chromosome 7, increased THSD7A mRNA levels, and elevated THSD7A protein expression when assessed by immunohistochemistry, suggesting that the tumor was actively synthesizing THSD7A. Because the patient underwent a hysterectomy 17 years earlier but that tissue was not available any more, we were not able to compare the normal endometrial tissue with the malignant tissue in this patient. However, there are some data from human protein atlases suggesting that THSD7A is not expressed on normal endometrium but may be weakly expressed in a few patients with endometrial cancer (http://www.proteinatlas.org/ENSG00000005108-THSD7A/cancer and http://www.proteinatlas.org/ENSG00000005108-THSD7A/tissue/endometrium). THSD7A protein was also detected in fDCs in the light zone of the germinal center of the tumor–infiltrated lymph nodes. The fDCs are a unique population of stromal cells, which are essential for germinal center formation and antigen presentation to maturing B cells.14,15 These findings strengthen the hypothesis of a potential mechanism linking malignancy and MN by which the immune system might have recognized THSD7A as a foreign antigen in the tumor cells, leading to production of high-affinity antibodies, which bind to THSD7A on podocytes in situ, forming subepithelial immune deposits, and initiating MN. Additional studies are needed to better understand which mechanisms might lead to a tumor or metastases, raising an autoimmune response to THSD7A. A surprising finding of our study was that the majority of patients with THSD7A-associated MN were women, whereas it has long been known that MN, particularly when associated with PLA2R1-Abs, affects mostly men. The clinical implications of this finding remain to be investigated. In the small study group, with clinical follow-up including THSD7A-Ab levels and disease activity that could be analyzed, only those patients in whom THSD7A-Ab had disappeared from the circulation had a complete remission of proteinuria, whereas in the patient with no remission of proteinuria, THSD7A-Ab persisted. The differences in the outcome were not statistically significant, probably because of the small patient number. Future prospective studies will show whether disease activity is associated with THSD7A-Ab levels in patients with THSD7A-associated MN, similar to that in patients with PLA2R1-associated MN.7,10,16–18 In the renal biopsies of patients with THSD7A-associated MN and malignancy, more inflammatory cells per glomerulus could be found compared with in those of patients with THSD7A-associated MN and no malignancy, similar to findings reported by others before.19 All other histomorphologic characteristics, including IgG4 positivity, were not different between patients with and those without malignancy. Our study has some limitations. The gene copy number of THSD7A and THSD7A antigen staining in tumor tissues could only be performed in one of the patients in this study, and mRNA analyses rely on data on one control patient. We observed differences in some clinical characteristics, such as age and serum creatinine, between the different cohorts. Currently, we can only speculate on the causes of these differences; however, the different inclusion criteria and the low patient number in each cohort might play a role in these findings. Additional prospective studies will very likely answer these open but important issues. We conclude that the new IFT is a reliable test for the detection of THSD7A-Ab and that THSD7A-Ab measurement is important for the diagnosis and clinical management of patients with MN. In the prospective Hamburg study cohort, 345 patients with newly diagnosed biopsy–proven MN were included. The serum tested for the presence of PLA2R1-Ab and THSD7A-Ab had to be collected within 6 months after renal biopsy. No immunosuppressive therapy was allowed before study inclusion. Two independent retrospective cohorts of patients with MN were analyzed. The Hamburg cohort included 689 mostly (82% of patients) PLA2R1-Ab–negative patients. The retrospective Boston cohort included 242 patients. In the retrospective cohorts, all patients with a diagnosis of MN were included independent of the time of diagnosis or prior treatments. In the retrospective Hamburg cohort, we included patients with MN who were negative for PLA2R1-Ab or had borderline PLA2R1-Ab levels of 14–20 U/ml measured by ELISA. In this cohort, 30 PLA2R1-Ab–positive patients were also included as a control group for the detection of PLA2R1-Ab positivity with the ELISA and IFT. The negative control group consisted of 112 patients with glomerular diseases other than MN: 24 patients with minimal change disease, 24 patients with IgA nephropathy, 23 patients with FSGS, 14 patients with lupus nephritis, 13 patients with membranoproliferative GN, six patients with ANCA vasculitis, six patients with amyloidosis, and two patients with cryoglobulinemia. In each cohort, the same diagnostic workup for secondary causes of MN was performed independent from the antibody findings; thus, patients with PLA2R1-associated MN had the same screening as patients with THSD7A-associated MN. In each patient, a detailed medical history was taken, and a physical examination was performed at every visit. A screening for malignancies was performed in the prospective Hamburg cohort and the Boston cohort and included, depending on the age and additional risk factors of the patient, serologic tests for lupus erythematodes and hepatitis, sonography of the abdomen, chest x-ray, endoscopy, etc. In the retrospective Hamburg cohort, data on secondary causes of MN were not consistently gathered. The follow-up visits of patients from the prospective Hamburg cohort and those with THSD7A-associated MN occurred every 3 months and included data on THSD7A-Ab levels, proteinuria, serum creatinine, and treatment. Sera of all patients recruited in the study were analyzed for PLA2R1-Ab and THSD7A-Ab by IFT. In the Hamburg cohorts, all 727 sera that tested negative for PLA2R1-Ab in the IFT as well as 30 randomly selected PLA2R1-Ab–positive sera were tested for THSD7A-Ab by Western blot. In the Boston cohort, all sera were tested for THSD7A-Ab by IFT and Western blot. The study was approved by the local ethics committee of the chamber of physicians in Hamburg as well as the Institutional Review Board at Boston University Medical Center, and it was conducted in accordance with the ethical principles stated by the Declaration of Helsinki. An informed consent was obtained from all participating patients. For detection of circulating THSD7A-Ab with IFT, an IFA Mosaic was used (Euroimmun AG). The slide contains a mosaic of four different biochips in one incubation field. The first biochip is coated with HEK293 cells expressing the PLA2R1 protein, the second biochip contains HEK293 cells transfected with an empty vector, and the third and fourth biochips are coated with HEK293 cells expressing the THSD7A protein as substrates. To achieve a semiquantitative measurement of THSD7A-Ab levels, three dilutions of serum samples (1/10, 1/100, and 1/1000) were prepared in PBS and 0.2% Tween and incubated for 30 minutes on the recombinant cell–based assay. An FITC–conjugated anti–human IgG Ab from goat (Euroimmun AG) was used for detection of bound total IgG Abs. All slides were evaluated using an LED microscope (EUROStar; Euroimmun AG). A specific cytoplasmic fluorescence of the transfected cells at a dilution of 1:10 or higher was considered positive. Remission of proteinuria was defined as proteinuria of <3.5 g/24 h and at least 50% reduction from the time of inclusion in the study. 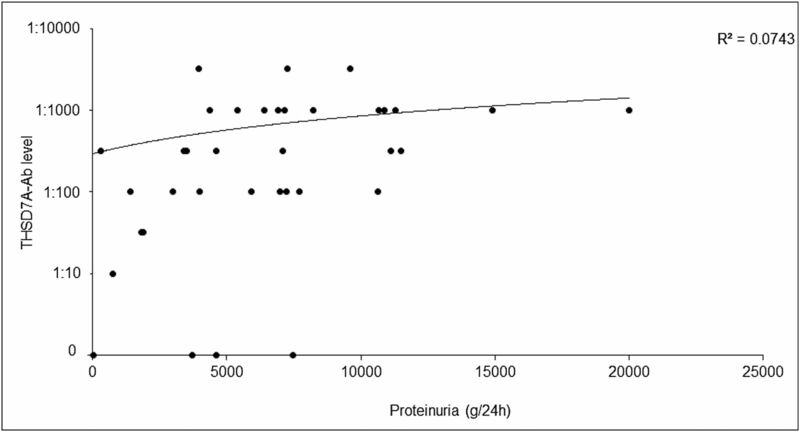 Complete remission of proteinuria was defined as proteinuria <0.5 g/24 h.
Data are given as means±SD or medians and interquartile ranges when appropriate. Statistical significance was defined as P<0.05. A Bonferroni adjustment was performed to account for multiple testing. In these analyses (Table 1), according to the Bonferroni correction, statistical significance is defined at P=0.03 (0.05/2; 2= no. of comparisons) (Supplemental Tables 1 and 2). A Mann–Whitney test was performed to assess for statistical significance. For analyses of categorical data, a chi-squared test was performed. Slides were deparaffinized, pretreated in citrate buffer (pH 6.1) for 15 minutes at 120°C, and cooled down in ice water (10 minutes). After rinsing in 100% ethanol, slides were incubated for 10 minutes with normal serum (Vector S2000; Vector Laboratories, Burlingame, CA) followed by PLA2R1-Abs (1:4000; Sigma-Aldrich, St. Louis, MO) or THSD7A-Abs (rabbit; Sigma-Aldrich; 1:4000 [for kidney tissue] or 1:500 [for tumor cells and lymph nodes] in antibody diluent; Invitrogen, Carlsbad, CA) overnight at 4°C. The slides were then washed in PBS, incubated with polymer 1 (Zytomed Zytochem-Plus AP Polymer-Kit POLAP), rinsed in PBS, and incubated with polymer 2 (Zytomed Zytochem-Plus AP Polymer-Kit POLAP). After washing in PBS, slides were stained in new fuchsin naphthol As-Bi phosphate substrate mixture (10 minutes) followed by 1 minute of nuclear staining in hemalaun (Mayer). After deparaffinization, slides were pretreated in protease 24 (5 μg/ml; Sigma-Aldrich) for 15 minutes followed by incubation with normal serum (Vector S2000; Vector Laboratories) for 10 minutes. Primary antibody was added (IgG, 1:7000; Dianova, Hamburg, Germany; IgG1 binding site, 1:20,000 or IgG4, 1:2000; DAKO) in antibody diluent (Invitrogen) overnight at 4°C. The slides were then washed in PBS, incubated with rabbit anti–mouse IgG (DAKO) for 15 minutes (for IgG and IgG4) or biotinylated anti–sheep IgG (for IgG1; Vector Laboratories) for 30 minutes, rinsed in PBS, and incubated with APAAP complex in PBS (1:500; IgG and IgG4) or ABC-AP reagent (IgG1; Vector Laboratories). After washing in PBS, slides were again incubated with rabbit anti–mouse IgG for 15 minutes, rinsed in PBS, and incubated with APAAP complex in PBS (1:500; IgG and IgG4). After washing in cold water (5 minutes), slides were stained with new fuchsin naphthol As-Bi phosphate substrate mixture (30 minutes). The slides were finally washed in water followed by 1 minute of nuclear staining in hemalaun. Small parts (1 mm) of the formaldehyde-fixed biopsy were put in sodium cacodylate buffer (10 minutes) and 1% osmium tetroxide (2 hours). After washing in cacodylate buffer and 1 hour of contrasting in uranyl acetate, the specimens were dehydrated in an ascending ethanol series and diethyl ether, embedded in araldite, and polymerized for 12 hours at up to 100°C. Semithin sections were stained with toluidine blue. Ultrathin sections were prepared and contrasted with lead (2) nitrate [Pb(NO3)2] and sodium citrate (C6H5Na3). Images were taken using a transmission electron microscope (Zeiss EM109; Carl Zeiss GmbH, Jena, Germany) equipped with a digital camera (TRS 2K-CCD). For immunofluorescence, 2 μM paraffin sections were deparaffinized and rehydrated to water. Antigen retrieval was obtained by boiling in citrate buffer (pH 6.1; DAKO S1699; autoclaved for 55 minutes at 121°C). Unspecific binding was blocked with 5% horse serum (Vector Laboratories) with 0.05% Triton X-100 (Sigma-Aldrich) in PBS for 30 minutes at room temperature before incubation at 4°C o/n with primary antibodies in blocking buffer. Staining was visualized with fluorochrome–conjugated secondary antibodies (1:400; Jackson ImmunoResearch Laboratories, West Grove, PA; 30 minutes at room temperature in 5% horse serum). Nuclei were visualized using DRAQ5 (Molecular Probes). Negative controls were performed by omitting primary antibodies. Stains were evaluated with a confocal LSM 510 Metamicroscope (Carl Zeiss GmbH) using the LSM software (Carl Zeiss GmbH). Primary antibodies used for the study were rabbit anti-THSD7A (1:400; Atlas) and mouse anti-CD21 (1:50; M0784; DAKO). All secondary antibodies were fluorochrome–conjugated, affinity–purified donkey antibodies (1:400; Jackson ImmunoResearch Laboratories and Dianova). For FISH analyses, a commercial kit was used (Histology FISH Accessory KIT; DAKO). A Spectrum Green–labeled THSD7A probe (EmpireGenomics) was used together with a Spectrum Orange–labeled chromosome 7 centromere probe (Vysis-Abbott). Before hybridization, sections were deparaffinized, air dried, dehydrated, and then, denatured at 72°C for 5 minutes in a ThermoBrite (Vysis-Abbott). After overnight hybridization at 37°C in a ThermoBrite, slides were washed and counterstained with 10 μl DAPI (Vysis-Abbott). RNA isolation, cDNA synthesis, and real–time PCR:RNA isolation from 10 μM paraffin–embedded tissue sections were performed with the High Pure FFPE RNA Microkit (Roche, Basel, Switzerland) according to the manufacturer’s recommendations. Ten microliters total RNA of the different samples was reverse transcribed by 200 U Revert Aid Reverse Transcription (Thermo Fisher Scientific, Vernon Hills, IL) using 100 ng random hexamer primer mix (Life Technologies, Carlsbad, CA) for 1 hour at 42°C. Real-time PCR was performed in a Step One-RealTime PCR System (Life Technologies) using 1 μl human THSD7A–specific (Genbank accession no. MN_015204) Taqman probes (Life Technologies), 10 μl 2× Fast Universal PCR Mastermix (Life Technologies), and 8 μl cDNA. For normalization of different RNA/cDNA qualities, SYBR-Green–based real–time PCR (Eurogentec, Cologne, Germany) using 1:100 diluted cDNA and human 18S rRNA–specific primers was performed. We thank Eugen Kinzler, Samaneh Liagos, Catharina Verkooyen, Janine Eisenmann, Christoph Rehbach, Silke Dehde, Anja Obser, Christine Koops, and Ulrike Langbehn for their technical assistance. This work is supported by Deutsche Forschungsgemeinschaft grants SFB 1192 project B1 (to E.H. and R.A.K.S.) and KFO 228 STA193/9-2 (to R.A.K.S.) and National Institutes of Health grants R01DK097053 (to L.H.B.) and R01DK090029 (to D.J.S.). The following colleagues participated in the recruitment of the patients for this study: Aedtner F., Halberstadt; Ahmed A., Freiburg; Aign S., Berlin; Altrogge H., Hamburg; Amir-Kabirian D., Hamburg; Arndt L., Buchholz; Arnold P., Siegen; Assenmacher A., Kamp-Lintfort; Baberg H., Berlin-Buch; Bachmann J., Arnsberg-Husten; Backs W., Hamburg; Bahte S., Hamburg; Bajeski V., Bielefeld; Baron J., Walsrode; Beck P., Langenfeld; Becker G., Wattenscheid; Beckermann J., Vechta; Beckmann M.-L., Bochold; Beckmann S., Herford; Behrend M., Westerstede; Beimler J., Heidelberg; Bek M., Mullheim; Benz M., Munich; Benzing T., Cologne; Bieringer M., Berlin-Buch; Biernat S., Varel; Biolik K., Berlin; Birkel J., Eggolsheim; Bischoff S., Dresden; Bödefeld T., Diepholz; Böhler J., Wiesbaden; Bohling M., Wilhelmshaven; Böhmer K. P., Nuremberg; Bokemeyer D., Bochum; Bork T., Freiburg; Boser M., Braunschweig; Bous A., Daun; Bozkurt F., Daun; Braasch E., Eberswalde; Bramstedt J., Bremerhaven; Braun J., Dingolfing; Breuer S., Kerpen; Brückner D., Dortmund; Brune K., Bad Rothenfelde; Bruns M., Hanau; Buchholz K., Emmendingen; Budde K., Berlin; Büldt E., Itzehoe; Burth E. M., Paderborn; Busch M., Jena; Busch V., Muenster; Büssemaker E., Hamm; Buth W., Minden; Clasen W., Muenster; Claus M., Essen; Dannemann E.-G., Gelsenkirchen; Daul A., Essen; David-Walek T., Kiel; Degenhardt S., Nettetal; Dellanna F., Dusseldorf; Dieckmann K., Flensburg; Dieterich F., Bad Oldesloe; Dillmann A., Bremen; Disteldorf E., Hamburg; Donauer J., Freiburg; Dorsch O., Kronach; Dose U., Siegburg; Döhler I., Dresden; Duvigneau D., Hamburg; Eckhardt K.-U., Erlangen; Edelmann B., Gelsenkirchen; Ernst M., Iserlohn; Falcke M., Hamburg; Fellenberg N., Hamburg; Ferber J., Leverkusen; Feyerabend G., Reinbek; Fielitz J. G., Elmshorn; Filejski W., Hamburg; Fina M., Hamburg; Floege J., Aachen; Fortnagel C., Pinneberg; Förster S., Ahrensburg; Frahm M., Eckernforde; Frank M., Pforzheim; Fricke L., Bochum; Fricke L., Lubeck; Friedrich B., Leonberg; Friedrichs I., Ansbach; Fuchs D., Oldenburg; Funk L., Freiburg; Gäckler D., Bochum; Galle J., Ludenscheid; Ganzemüller C., Minden; Gerhardt T., Bonn; Gerke P., Lubeck; Gerth J., Zwickau; Glorius P., Templin; Gödel M., Freiburg; Gök Ö., Freiburg; Goldmann A., Neunkirchen; Gööck T., Arnstadt; Göttmann U., Mannheim; Graf G., Bad Bevensen; Gras K., Hamburg; Grewe B., Perleberg; Griesche-Philippi J., Luneburg; Groll J., Berlin; Grosser S., Hamburg; Grütter R., Dinslaken; Güz A., Ludenscheid; Haas C., Lubeck; Haberstroh U., Limburg; Hättig O., Offenburg; Hagenah F., Offenburg; Hahn K., Dortmund; Hamadeh A., Hoxter; Hammerschmidt M., Erlangen; Heckel M., Kronach; Heering P. J., Solingen; Heidenreich S., Aachen; Heinrichs S., Dusseldorf; Hengemühle H., Bremen; Hermann R., Mullheim; Hermle T., Freiburg; Hetzel G. R., Dusseldorf; Hintzen-Kruse C., Chemnitz; Hochtritt M. S., Celle; Hohenstein B., Dresden; Hohmann M., Vechta; Holl W., Solingen; Hollenbeck M., Bottrop; Horn G., Erlangen; Hörnig B., Berlin; Hoyer J., Marburg/Lahn; Huber T., Freiburg; Hugo C., Dresden; Isbell L. K., Freiburg; Jabs W., Berlin; Jacobson J., Dortmund; Jacobsen J., Winsen; Jäkel S., Bochum; Jank S., Erlangen; Jankrift P., Unna; Jasinski R., Freiburg; Jung O., Frankfurt; Kaan T. G., Leer; Kahlke D., Hamburg; Kämpf H., Sonneberg; Keller F., Ulm; Ketteler M., Coburg; Kidder D., Buchholz; Kiziler F., Bochum; Kisner T., Cologne; Klause N., Eckernforde; Klehr H. U., Bonn; Kleinecke R., Bamberg; Klemm A., Jena; Knevels U., Unna; Knittel M., Witten; Koch C., Nuremberg; Koch M., Velbert; König D., Braunschweig; Köstler F., Elmshorn; Kohnle M., Hilden; Korschanowski A., Cuxhaven; Kortus-Götze B., Marburg/Lahn; Kositz H., Greiz; Kramer-Zucker A., Freiburg; Krämer-Guth A., Freiburg; Kreft B., Hildesheim; Kremerskothen R., Muenster; Krenz I., Hamburg; Krumme B., Wiesbaden; Kube M., Hamburg; Kühns A., Hamburg; Kunigk F., Pinneberg; Kurschat C., Cologne; Lange I., Perleberg; Lange D., Heilbad Heiligenstadt; Lange-Hüsken F., Hamburg; Laube C., Bremen; Laue O., Hannover-Langenhagen; Lauerwald W., Gera; Leidig B., Cologne; Leimbach T., Berlin; Leingärtner T., Regensburg; Lepenies J., Berlin; Leschniewski M., Essen; Linden H. M., Erfstedt; Linke B., Oldenburg in Holstein; Loke O., Ludenscheid; Loley G., Osnabruck; Lohmann T., Dresden; Lorenz G., Melle; Lotz W. P., Bremen; Loyen M., Muenster; Lufft V., Rendsburg; Mander I., Lehrte; Marx C., Nordhausen; Mees S., Hamburg; Meier-Sundhaussen G., Berlin-Marzahn; Meinke D., Ludenscheid; Melching R., Gutersloh; Mertens P. R., Magdeburg; Messtorff K., Stade; Mettang T., Wiesbaden; Meyer W., Buchholz; Meyer T., Hamburg; Meyer-Delpho M., Siegburg; Middendorf C., Melle; Möller J., Leverkusen; Mohler C., Ludenscheid; Morgenstern T., Koblenz; Müller R., Braunschweig; Müller R., Westerstede; Nesbigall T., Kaiserslautern; Neuber F., Zittau; Neumayer H. H., Berlin; Nöthen W., Siegburg; Oberle G., Hannover-Langenhagen; Oppermann M., Perleberg; Orlt A., Heilbad Heiligenstadt; Özcan F., Dortmund; Pape A., Walsrode; Pätzold C., Kamen; Pavenstädt H. J., Muenster; Petersen M., Hamburg; Pfalzer B., Hamburg; Pilz M., Nottuln; Plöger A., Bielefeld; Plogmann C., Essen; Pöge U., Bonn; Potratz J., Gottingen; Pützfeld C., Oberhausen; Regenberg M., Cuxhaven; Reichenberger F., Cottbus; Reinking R., Elmshorn; Rensinghoff E., Wattenscheid; Ricken J., Rheine; Riechers G., Braunschweig; Riedasch M., Coesfeld; Rob P. M., Lubeck; Röben T., Vechta; Roch P., Regensburg; Rockstroh S., Dresden; Rösch M. A., Hamburg; Rosenburg C., Aschersleben; Rudnicki M., Innsbruck; Ruhberg B., Hamburg; Rump C., Dusseldorf; Sass A., Greiz; Schäfers R. F., Oberhausen; Schaumann D., Hameln; Schenk L. K., Muenster; Schilken P., Paderborn; Schlee H., Weissenfels; Schmedding I., Freiburg; Schmidt R., Wesel; Schmiedel D., Bad Nenndorf; Schmidtmann K., Westerstede-Ocholt; Schmitz F.-J., Minden; Schnegelsberg O., Winsen; Schneidenbach R., Hamburg; Schneider A., Neuwied; Schneuzer C., Hamburg; Schnierda J., Waldshut-Tiengen; Schnitzler A., Luneburg; Schreiber R., Coesfeld; Schröder S., Glauchau; Schüler A., Bad Nenndorf; Schüler M., Erlangen; Schulte-Vorwick M., Unna; Schulze M., Bad Zwischenahn; Schürmann E., Riesa; Schwarz M., Verden; Schwertfeger E., Freiburg; Seifert A., Schleswig; Serwas A., Muenster; Seuffert H.-M., Karlsruhe; Seyfried J., Pforzheim; Siegmund J., Hamburg; Siwek-Orman E., Arnstadt; Soldan E., Hamburg; Solf A., Heilbad Heiligenstadt; Sonneberg W. P., Bad Rothenfelde; Spellmeyer G., Greven; Spiess M., Kaiserslautern; Stahn A., Hamburg; Steinhauer H. B., Cottbus; Steinhoff J., Lubeck; Steinmetz M., Siegburg; Stiasny B., Schwabach; Storkenmaier R., Sindelfingen; Sturm E., Hamburg; Tacuri-Strasser D., Offenburg; Teichler S., Naumburg; Thiel M., Berlin; Tholl U., Kleve; Tiedeken P., Hamburg; Tillmann F.-P., Emsdetten; Tjiang D., Königslutter; Toussaint K., Hamburg; Treiber W., Neuwied; Tripps C., Oschersleben/OT Neindorf; Tröster S., Westerstede; Uhle A., Bochum; Unger T., Hamburg; Valentin R., Bielefeld; Vischedyk M., Paderborn; Vitu J., Hamburg; Volsek M., Essen; von Appen K., Hamburg; von Sass A., Greiz; von Zitzewitz A., Ahrensburg; Vosskühler A., Bottrop; Wagner K., Hamburg; Watter T., Freiburg; Weber M.-H., Gottingen-Bovenden; Weidemann C., Erlangen; Weiner S., Trier; Weinert R., Bad Salzuflen; Weiss M., Hamburg; Weitzell R., Uelzen; Wiedemann F., Nagold; Wienbeck C., Hamburg; Wiesener M., Erlangen; Willecke J., Freiburg; Wilms H., Hamburg; Wirtz G., Kamen; Wittberger W., Gladbeck; Witthus M., Cologne; Wittmaack D., Itzehoe; Woggan J., Hamburg; Wolf G., Jena; Wolfram L., Hamburg; Wollweber T., Wadersloh; Wullstein H.-G., Hamburg; Zander A., Verden; and Zeier M., Heidelberg. This article contains supplemental material online at http://jasn.asnjournals.org/lookup/suppl/doi:10.1681/ASN.2016010050/-/DCSupplemental.